CHICAGO, IL (08/25/16) – THE MISSION is pleased to present Materiality, a solo exhibition of recent multi-media works by Matt Magee. An opening reception will be held on Friday, September 9 from 6 to 8pm and the exhibition will continue through Saturday, October 22, 2016. Magee’s varying use of materials and methodologies adhere to a consistent, meticulous sensibility. His father, a geologist and archeologist, taught Magee to collect natural elements and organize them in rows to examine, compare and learn from them. This systematic ordering was further honed during his nearly 20 years as archivist at Robert Rauschenberg’s studio. Magee organizes painted shapes, and found and accumulated objects into hard-edged geometric paintings, collages and sculptures. Sequencing objects such as detergent bottle cut outs, pea gravel and aluminum, Magee creates organic textures from man-made materials. His paintings appear analytical with an exactness parallel to Modernist works by Agnes Martin; but with slight imperfections and evident brushstrokes, the surfaces deviate to a more playful sensibility. 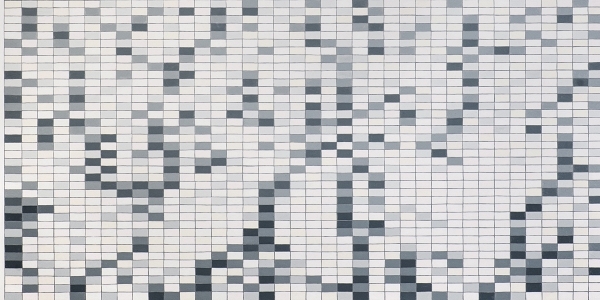 In Grey Algorithm, 2015, Magee’s processing of undefined data materializes into a rectangular grid of varying, but subtle color fields bound by the finite space of the panel. Although inspired by the mathematical calculation, chance and intuition guide Magee’s composition. Form, substance, color and oddity are central themes in his sculptures where Magee connects disparate materials to create peculiar, coalesced objects. His worktable offers a meeting place for these otherwise dissonant items – coral, metal gears, bottle caps, twist ties, pipes, rocks and metals bolts. Magee shuffles, stacks and rearranges until the right partnerships find themselves. Through his innate, categorical and formal language, he reveals his observations and provokes our own curiosity of the world. In his paintings, sculptures and prints, he creates a language of symbols that sends an open-ended message; he is an alchemist, turning letters into abstract forms and everyday objects into language, suggesting that immaterial ideals can emerge from material forms… Magee’s work transcends time in a way the history that surrounds it can’t, by indicating how familiar geometric shapes create new messages for each decade. MATT MAGEE received an MFA at Pratt University (Brooklyn, New York) and a BA at Trinity University (San Antonio, TX). He has recently exhibited solo exhibitions at Hiram Butler Gallery (Houston, TX), Richard Levy Gallery (Albuquerque, NM), John Molloy Gallery (New York, New York), inde/jacobs (Marfa, TX), among others. Magee was awarded residencies at Tamarind Institute in 2013 and 2016, and Josef and Anni Albers Foundation in 2007 and 2015. Magee was born in France and subsequently lived in Tripoli, Libya; London, England; Dallas, TX; San Antonia, TX; and New York, NY. Magee currently lives and works in Phoenix, AZ. An essay by New York-based writer Mimi Thompson will be featured in an exhibition catalogue and is available online.